Mobile speed and experience – Google’s 2.4 second sweet spot - Edit. One of our clients recently attended a presentation by a Google Mobile UX Manager, which has some useful information on Google’s view of the ideal mobile experience. Mobile’s long been a focus for Google which has become obvious with the whole “mobile first index” switch, which obviously means they think that mobile search will continue to take up desktop search share. Now more than ever is the best time to turn your attention to improving your mobile experience. Still struggling to convince a client that investment into improving the mobile UX of the site is worthwhile? Well Google’s slides began by stating that “mobile pages that load 1s faster see up to +27% CvR”. And that’s all well and good, but what I was more interested in is what Google see as the ideal load time for mobile. Well, 2.4 seconds is the sweet spot apparently, as they consider this to be a “good” load time, so if you’re hitting this, then you’re winning. 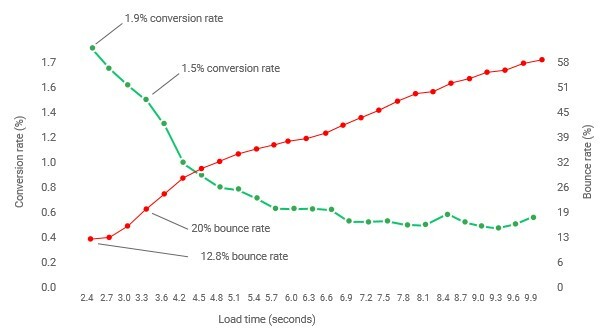 That doesn’t mean to stop improving the load time though, echoing the sentiments of Stephen Kenwright’s talk at BrightonSEO “best practice is not enough”. Interestingly, Google rely a lot on a tool we commonly use here at Branded3 called WebPageTest to get site speed within their slides, so it appears that it’s a reliable tool. I sense a big update coming to their Page Speed Insights Tool! 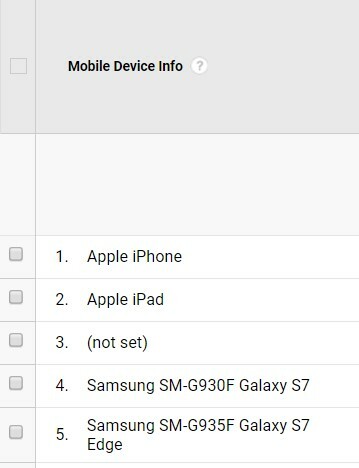 Anyway, in this example they tested on a Nexus 5 but you should look to test on a few mobile traffic devices which are the most traffic driving (Google Analytics -> Mobile -> Devices). Using the Branded3 site as an example, the top traffic driving devices are the iPhone, iPad and Samsung Galaxy S7, so this would be our top priority. Testing the Samsung Galaxy S7 as an example on the Branded3 site, the time that Google care about is the document complete time and the speed index, which they say should be <5000. And, as you can see by the image below, the Branded3 site is very slow in regard to Document Complete time which is the more important of the two. (mental note to go poke one of our developers). It gives you a useful breakdown of each of the elements in your results and a grade. If you click the grades, it gives you further information on what you can do to improve them – it appears that we need to improve our TTFB (time to first byte) and our Cache static content. There are a few interesting things that Google point out to help reduce load time in their slides. One of which is to use something called Base64, which is a tool Amazon run their onsite images through. It’s essentially just an image compression tool, but if Google are recommending it and Amazon are using it, perhaps it’s one of the better tools. Google have also confirmed something I was a little bit hesitant about, which is Lazy Load. This tool allows loading of images just before the user needs the content so it only loads when the user scrolls, improving initial load times. But, it massively increases “fully load” times obviously and when you fetch and render a lazy load page it doesn’t appear properly, so there was a bit of a hesitation around implementing it. However, Google only say to implement it for mobile and the Scripts they reference are Lazy Sizes. The presentation goes on to giving some tips around how to best optimise your user experience on mobile devices. Another thing they reiterate across several slides is to display value propositions at every step of the funnel, and to ensure that you answer the question “why should they choose you?” at every step of the mobile journey. Engagement features can also be a big win, using things such as site search means more people convert, and it’s something that should be visible throughout the site. Another talk by Stephen Kenwright also highlights the importance of internal site search and how getting it right can improve conversions massively. WebPageTest is one of the most reliable tools to use – Google use it! Limit exit points on checkout and give clear signals of success (reviews).